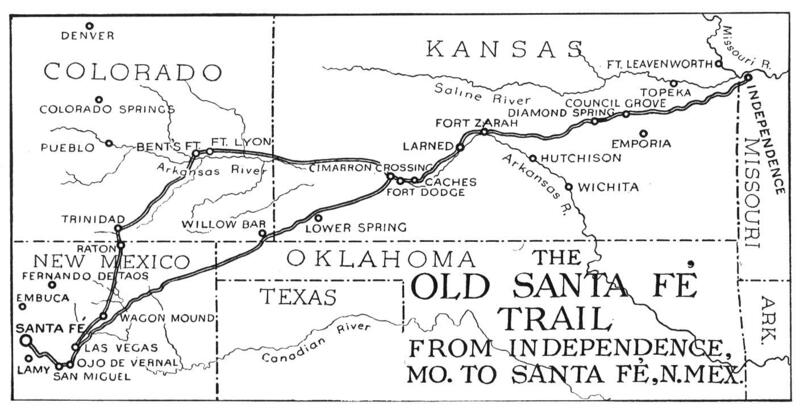 Even now the old Santa Fe Trail conjures up romance and Western adventure. 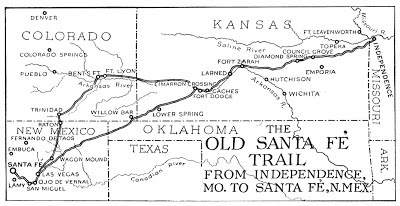 The Atchison, Topeka and Santa Fe Railway laid tracks along that trail from Independence, Missouri to Santa Fe, New Mexico. My CFHS March 27th post centered around Fred Harvey and the Harvey Girls. He advertised for "young women 18-30 years of age, of good character, attractive and intelligent" as waitresses in his restaurants. He opened the first Harvey House in 1876 in Topeka, Kansas. By 1917, there were 100 Harvey Houses across the United States. It wasn't long before Mr. Harvey and his staff saw another need and they set out to solve it. Travel in the Southwest was dismal, if not downright dangerous. There were few amenities to attract the wealthy travelers, who now wanted to get off the train and walk amongst the flora and fauna. Crossing the country in a private car was still a rugged undertaking with few surfaced highways. The Indian Detours were formed to allow travelers to leave the train and take one to three day wilderness territory tours into the Indian Reservations of New Mexico and Arizona. In 1899, the "horseless carriage" was commissioned to be build for addition to the Harvey transportation stable of wagons and buckboards. With luxury ever the hallmark of Fred Harvey, the fleet of Harvey Cars were Cadillacs, Franklins, White Buses, and the Packards, which didn't last more than 30,000 miles on the rough roads. The large vehicles were to be used for sightseers from the Santa Fe station at Flagstaff to the Grand Canyon of the Colorado River. In keeping with the railroad theme, the Harvey Cars were called road pullmans. 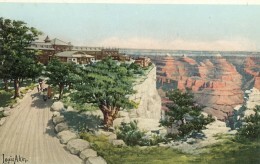 Once the El Tovar opened at the Grand Canyon in 1905, the Harvey staff began organizing more extensive entertainment for guests. Tour areas and information on the culture of the Hopi and Navajo peoples were developed. Seven different routes, covering 13 to 66 miles, left from the El Tovar. For a flat fee of $4, a guest could travel through pine forests, view amazing rock formations, natural springs, wells, waterfalls, and visit area ranches. For $30, a 66 mile round trip included Aztec ruins, dams, lakes, and wildlife. 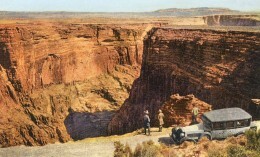 By 1923, the Grand Canyon - the big gully - was dedicated as a National Park. 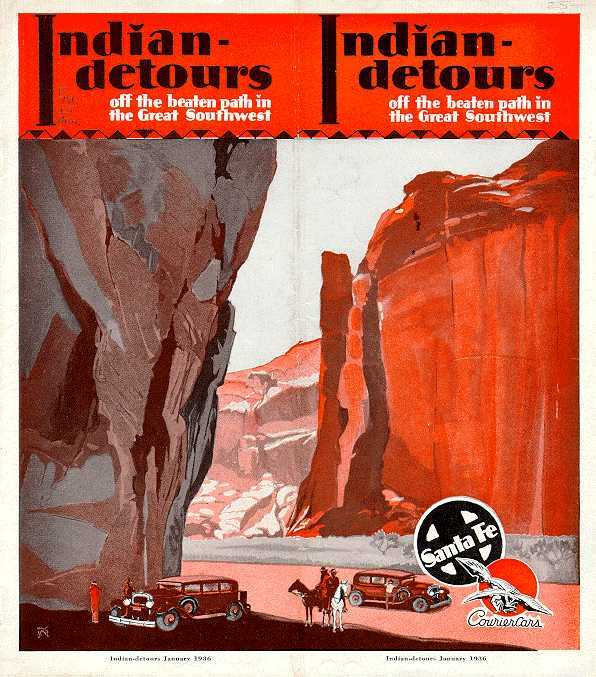 Brochures advertised four of the most unique tours "in all the word": the Grand Canyon, the Petrified Forest, the Painted Desert, and the Indian Pueblos. Traveling through these places was one thing, but learning about them was a whole new endeavor. 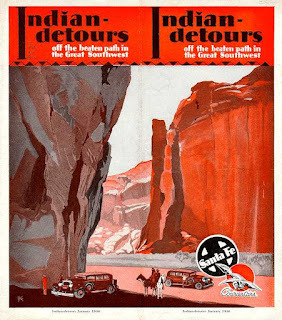 The Indian Detours were organized in the spring of 1926 to conduct travel through oldest America, in the New Mexico Rockies between Las Vegas and Albuquerque. The Albuquerque Morning Journal, August 20, 1925, carried the announcement. In part it advertised, "The three-day personally conducted educational tour will comprise visits to old Santa Fe, the inhabited Indian pueblos of Tesuque, Santa Clara, San Juan, Santa Domingo, and other points in the picturesque valley of the upper Rio Grande, as well as to the huge communal ruins of Puye, a cliff pueblo 20 centuries old." This all-expense motor trip would cover nearly 300 miles, and include meals and hotel accommodations to well known, but "little seen places in the Indo-Spanish southwest." According the R. H. Clarkson, Assistant to Ford Harvey, Fred Harvey's son, "There is more of historic, prehistoric, human and scenic interest in New Mexico than in any other similar area in the world, not excepting India, Egypt, Europe, or Asia." The "personally conducted" feature of the excursions would prove to be the secret of the Indian Detours success. A school for drivers and couriers was conducted by the Santa Fe and Harvey system to give the 'detourists' the ultimate experience. 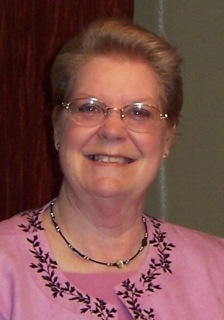 Erna Fergusson, who had used women guides in her Koshare Tours, was hired to train the first twenty Harvey Detour Couriers. When interviewed she said, "Couriers are expected to be young women of education and some social grace, able to meet easily and well all kinds of people. They are expected to be intelligent enough to learn many facts about this country and to impart them in a way to interest intelligent travelers. They are selected also with an eye to their knowledge of the southwest, their knowledge of Spanish, and any special knowledge or ability that will assist them in presenting this country properly." The top training candidates were college graduates, at least 25 years old, and primarily natives of the area. They had to be willing to take a crash course in history, politics, sociology, anthropology, geology and arts. Unlike the Harvey Girls, there was no rule that they remain unmarried in order to continue working. Some of the first applicants were daughters of prominent New Mexicans - senators, secretary of state, judges, ambassadors. In the first group, professional backgrounds varied. Two had been guides for the Fergusson's Koshare Tours; some had been newspaper women; one was a writer; one, a member of an interior decorating establishment. There were teachers, one had taught at the U.S. Indian School at the Tesuque Pueblo, and another from the New Mexico School for the Deaf. Being fluent in other languages was also a plus. A veritable army of instructors was assembled from all over the nation. The Couriers were expected to know enough Spanish to carry on a basic conversation at the pueblos. The Indians spoke not only their own tribal dialect, but, in many cases, also spoke Spanish. Classes were often conducted on-site at the pueblos, artist colonies and homes, art museums, and in the desert. The Indian Detours with the addition of the Couriers became so popular that new recruits were trained every six months. Typical test questions might include: "How do Indian women bake bread in outdoor ovens? ", "What language do they speak? ", "When did the cliff dwellers inhabit Puye? ", "How much is an acre of land in New Mexico, and how many crops of alfalfa can be raised in one season?" They had to have statistics about the area on the tip of their tongues. Knowledge such as mountain heights, population of various pueblos, names of Taos painters and artisans, and explain the features of the desert. They wore uniforms that were attractive, consistent with the theme of the tour, comfortable, and durable. Couriers were as hearty and talented as their hand-picked counterpart, the HarveyCoach drivers. They could fix a flat and pump gas, and a myriad of other automobile related chores. 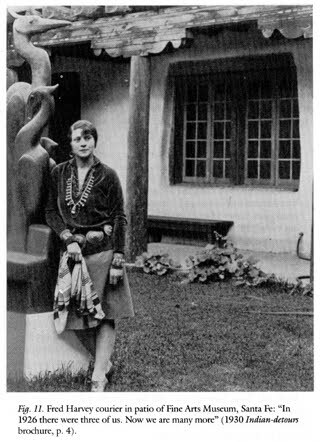 One of the Couriers, Anita Rose, was called by the Cleveland Plain Dealer, a "pioneer hostess among cliff dwellers" and an example of the new college woman. Next month we'll talk a bit more about the Couriers and their Drivers. Have you ever visited the wonders and felt the enchantment of New Mexico? Leave a comment for a chance to win a book gift certificate. Please include your email address and specify that you would like to be in the drawing. Winner will be posted in the comments on this blog post no later than June 22nd and in the sidebar. Lin grew up and graduated from Lovington High School, Lovington, New Mexico. The first book in her new Voices in the Desert series, Lost Memories, is set in 1926 and introduces Mariana Forbes and her adventures as a Southwestern Indian Detour Courier. 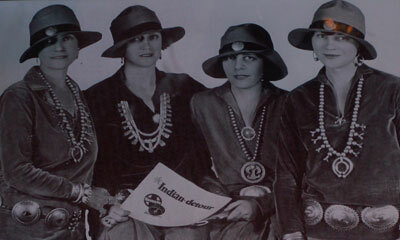 The other four books span the years of the Indian Detour Couriers from 1926-1932. Good morning, Brenda, you mentioned two of my favorite books. I've also been enjoying the Harvey Girls Cookbook Project at http://fredharveycookbook.tumblr.com/. Can you imagine living in the East, hearing about savage Indians, the Petrified Forest, and the Painted Desert, then having the chance to get "off the beaten path" of train travel and visit those places with the Couriers and Drivers. What an adventure.Thanks for letting me know about the exhibit. We have family near Kansas City. I think it's time to organize a road trip. You're in the drawing. I had never heard about the Indian Detours! Sounds like it was really quite a huge enterprise. Mr. Harvey was quite a groundbreaker in many ways! Hit that submit button too quickly! ;) I would like to be entered in the drawing, please! Hi Bethany, a lot of folks haven't heard about the Couriers and the Indian Detours. I think, in part, because we think of 1926 as being so close in time that we know all about it. Although it was short lived, in comparison with other Harvey endeavors, it was a fascinating time. Thanks for stopping by. You're in the drawing. Hi, Pam, thanks for stopping by. It has been incredible researching more deeply something I've heard about all my life. Growing up in Lovington, New Mexico, we were introduced to the Harvey empire as a brief part of our history. I dreamed of the marvelous adventures the Harvey Girls and the Couriers could have in our wilderness state. I'm hoping that the Voices in the Desert series will capture some of those adventures. I've never visited New Mexico or any of the American Southwest for that matter! I have spent a bit of time in the Northwest... Would love to visit the Southwest sometime! Hi Patty, you won't regret the trip or the time. There's a reason they call it The Land of Enchantment. The first time I visited Carlsbad Caverns in the mid-fifties we had to crawl through a rock tunnel to get into the main cavern. Yes, crawl and while it seemed like an eternity, it was about about 30 feet. That's when I discovered I would never be a spelunker or visit another cave as long as I lived. When they turned off the lights, the darkness was heart stopping. They've since removed the tunnel and opened it up into a nice walk down, but I think they still turn off the lights for a few seconds - another eternity. Hey, Girl, love your post. Thanks, Lena, it was a lot of fun to research and write. Re-read your "Love Finds You in Golden, New Mexico" over the weekend. We took Hwy 14 —the Turquoise Trail— through Golden. We enjoy old churches, pueblo ruins, and general merchandise stores like Henderson's General Store; especially when they're in New Mexico. I really enjoyed your post. I've read Fred Harvey history, but must have missed the Indian detours. Thank you for sharing!! Please enter me in your giveaway! Thank you, Barbara. So many articles are written about the Harvey Girls with only a sentence or two about the Detour Couriers. You would enjoy reading Indian Detours by Diane Thomas. I've put you in the drawing. Thanks for stopping by. I enjoyed the post..I've read books about that tour...it was very interesting and I liked the twist it put on the "harvey" girl name. please enter me in your giveaway too! Thanks for leaving a comment, Eliza. You're in the drawing. It has always fascinated me that this highly visible and "educational" endeavor didn't move along with the advent of the "private touring cars." Guided tours could still be happening today using the same philosophy and techniques. This was a fascinating post, as was the prior post on Fred Harvey and the Harvey Girls. I knew nothing about the Detours and it all sounds wonderful. How exciting to be one of the Couriers! It sounds like a "dream job" for young women in those days. Yes, I have spent 2 weeks touring New Mexico, when my daughter lived in Las Cruces. It was a great experience, but not long enough to see everything, of course. Hi Kay, thank you for your kudos. I wonder if the 1926 and beyond dates on the tours make them feel too recent to be considered historical. Yet, it has been 87 years. In "Treasure Among the Ruins," I'm exploring being newly graduated from college, ready for something unique, and having parents with other expectations than "driving around in a car all day long." I'm glad you enjoyed your trip to New Mexico. My brother and sister graduated from college in Las Cruces. I chose a Texas college. That seems a world ago. You're in the drawing. I definitely think most readers would consider 1926 "historical". Things have changed so much since then. It is totally a different world. This was very interesting. I have been in New Mexico, but have not really had the chance to visit many places. Would love to go again some day! Thanks for the giveaway. God bless. Hi Betti, thanks for leaving a comment. I've added you to the drawing. When I was in the third grade, we moved from Piggott, Arkansas to the plains of Lovington, New Mexico in the southeast corner of the state. At first the lack of trees, bushes, and grass was horrible. But as I learned about my new home, I became a desert lover. The whole state is wonderful and truly enchanted. Never been to New Mexico (and know I won't now at my age...lol)...so really enjoyed your post! Please enter me for the gift card..........thanks. Hi Jackie, thank you for your kudo. If you ever get to toss a rock at a New Mexico cactus or visit the Four Corners Monument and walk a bit in Arizona, Colorado, New Mexico, and Utah don't pass up the chance. It's a marvelous experience. You are on my list! Great post - learned something new again. Hi Susan, wouldn't it be great to take a tour with a reliable, knowledgeable, enthusiastic guide and a driver who knows how to fix a car and doesn't need to call a tow truck. Oh, those bygone days! I so glad you enjoyed the post. You're on the list. Blog says this contest result will be posted on June 22, but I just got this today, June 27! anyway I have been to Santa Fe, NM and Albuquerque, NM and it's very beautiful. I've also read a series of books on the Harvey Girls by Traci Peterson, THE DESERT ROSE SERIES (I think this is the one). Would love to win your book! I love the topic, the National Parks and the National Park Lodges! We build our vacations around them. Hi Sharon, you're on the list. The 22nd was a slip of my exuberant fingers. It should have read the 28th to give everyone coast to coast a chance to read the post. Traci's series is a wonderful fictional introduction to the Harvey Girls. I enjoy traveling. Wish I could do more. Thanks for commenting. So much interesting history to be learned about this country. I am still working on the US, and know next to nothing about other countries. Hi Martha, thanks for stopping by. I think you're finding my recent discovery - there's so much in your own backyard. I looked at my bucket list again and realized that every place I want to see is right here in the U.S. You're on the drawing list. Congratulations, Jackie, you're the winner of my give-away this month. My email to you is on its way. I look forward to hearing from you.